The female vocalist has been appearing on John’s recordings for a number of years so it was a matter of putting all of us together for live shows. The band has put out a number of singles accompanied by witty and humorous YouTube videos and recently were referred to as “grin inducing” in the press for their contribution to the Together for Christmas CD released 2012. 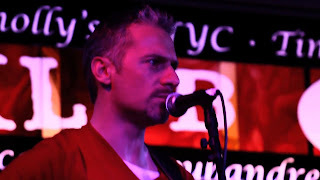 Band is based in Brooklyn with occasional forays home to Ireland. Their music is eclectic, soulful but always with a lyrical depth and a finely tuned wit.